In the late 1800's, Antelope was the only significant settlement in the Center Township, an area bounded on the North by the Placer county line, on the East by what is now Sunrise Blvd., on the South by the American River, and on the West by the line along 20th St in Rio Linda south to Ethan Way in the Arden-Arcade area. The population of the entire township in 1880 was about 400 people. On April 28, 1973, Antelope consisted of a post office, general store and a half-dozen homes - a place hardly worthy of notice. 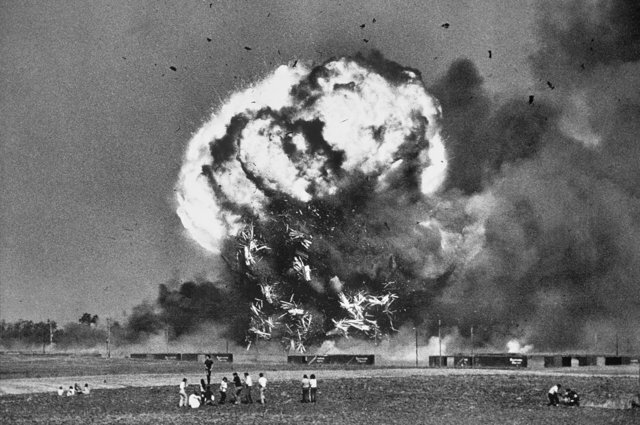 However, at 8:03 a.m., a rail car loaded with aircraft bombs exploded in the southern part of the Roseville switch yard destroying the general store and damaging most of the homes. Search for other articles on the explosions. From History of Sacramento County, California 1880 1960 reprint, by Thompson and West. "Antelope is a small settlement, located on the Central Pacific Railroad, near the center of section tewnty-one, T. 10, N. of R 6 E. The town was regularly surveyed in 1878. In 1876, a large brick warehouse, forty by one hundred feet in size, was built by J.F. Cross at a cost of three thousand dollars. This was the first building erected. There are [sic. is] one hotel built by Richard Astile in 1879, two blacksmith shops, two stores and four dwelling-houses in the town. The first store was started in May, 1877, by the Antelope Business Association, an incorporated company. The association sold out in the fall of 1878 to John Berry, who continues the business, and is also agent for the railroad, telegraph operator and Postmaster. The second store was started, in 1879, in the hotel building, by R. Astile. 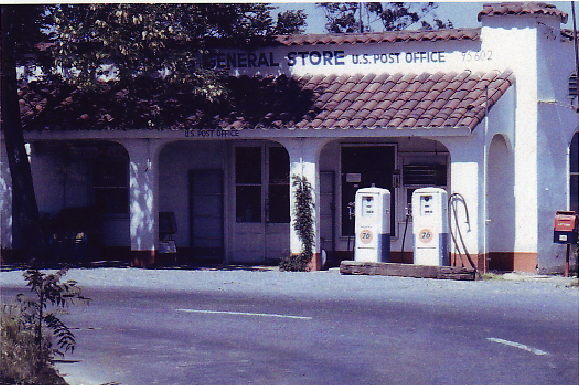 The Post Office of Antelope was established in 1877; Joel Gardner, Postmaster. In 1878 he was succeeded by John Berry, the present incumbent. This is the only Post Office in the township. Antelope is the shipping point for large quantities of grain both to Sacramento and the mountains. " J. D. and Jennie Gould were early pioneers arriving before 1858. Elisha Sample Driver arrived in 1854 and in 1857 bought 1,200 acres between Walerga Rd. and Dry Creek. In 1871 Richard Gladney and Andrew Ramsey Finley, Gladney's brother-in-law, moved to the area. The Rhodes and McBride families who lived in Antelope for many years are descended from the Gladney's and Finley's. Finley's son-in-law Thomas McBride bought the property on N. Antelope Rd. after he married Martha Emma Finley in 1879. Pruett's are another old time family in the area. Racecar champion Scott Pruett is probably the most famous former Antelope resident. Other old time families include the Ackerets, Astiles, Blacks, Brobergs, Corss', Crowders, Brobergs, Downing, Hollings, Jugarakis, Lauppe, O'Rells, Schellhous, Thompsons and Van Epens. Roy Ackeret and some of the Drivers are the only descendants of the old time families still living in Antelope, however there are members of the Gould, Pruett, Rhodes and other families still living in Roseville and surrounding areas. Many of the local farmers were members of the Grange and the Antelope Grange Hall, built in 1915-16, was a popular meeting place. In 1954 there was a 50th wedding aniversary celebration for Mr. and Mrs. Arthur Thomas McBride at the Grange Hall, with over 250 family and guests in attendance. It was destroyed in the 1973 railroad explosion, but members continued to meet in Citrus Heights. See history. The Antelope Sewing Club was originated by Mrs. Mary (Max) Holling after her son, Elmer, was killed in WWII; she honored his memory by inviting farm wives to a weekly meeting to make Red Cross Bandages. The members included Hollings, Schellhous, Blacks, Downings, Jugarakis, Lauppes, McBrides, O'Rells, Pruetts, Goulds, Rhodes, Thompsons and Van Epens. Descendants of these women and their spouses continue to meet today. See the Sewing Club Page. The center school was built in 1858. The Union District of Placer County was established in the area of Mr. Dyer's census. JG Gould, Dyer and J. Williams were the first trustees. Mr. Gould was the first clerk. 1886 Arthur Gould, Grandson of JG Gould, went to school at Center. Dry Creek School, built in 1876..
Andrew Ramsey Finley who had property on North Antelope Rd. and PFE Rd. donated the land for the School so the local kids wouldn't have to go so far to school. Bea (Pruett) Gould was a teacher there and Finley's Great, Great Grandson, Bob Anderson was principal. Four generations of Pruetts, who had property adjoining the school, attended.